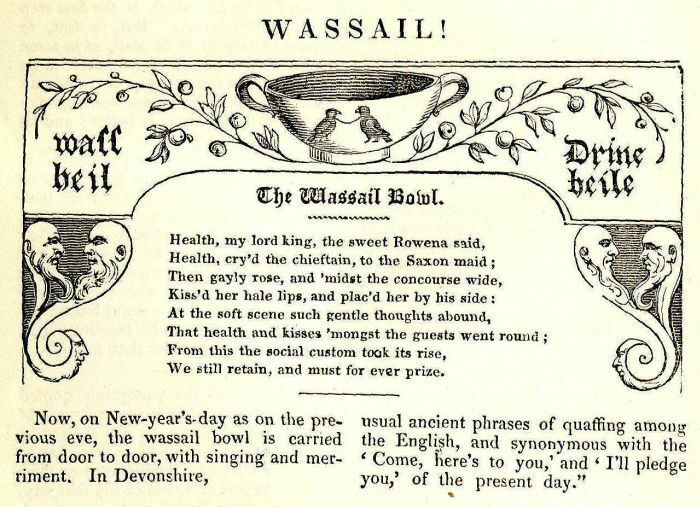 The Wassail Song is among the best known of the traditional wassail songs, and was well-known throughout England by the middle 19th century. It's roots, however, certainly go back even further. Rev. Ian Bradley makes the excellent point that the tradition of wassailers going door to door, singing and drinking to the health of those whom they visit, goes back to pre-Christian fertility rites where the villagers went through orchards at mid-winter singing and shouting loudly to drive out evil spirits, and pouring cider on the roots of trees to encourage fertility. The ancient rite of wassailing trees was well known in Devonshire, Herefordshire and in other parts of the West Country of England (and elsewhere? please let me know). It generally took place on Twelfth Night (January 5th), or sometimes on 17th January, known as Old Twelfth Night. Farmers and their families would feast on hot cakes and cider, then they would go into the orchard with more "supplies." A cider-soaked cake is laid in the fork of a tree and then more cider is splashed on it. The men fire their guns into the tree and bang on pots and pans while the rest of the people bow their heads and sing the special "Wassail Song." This custom is said to ward off bad spirits from the orchard and encourages the good spirits to provide a bountiful crop for the following year. In other traditions, the men of the village went out to the orchards carrying the wassail bowl, to alternately serenade and browbeat the apple trees. There were songs, dances and libations (for tree and man alike) until finally, in frustration, the trees would be threatened with the axe if they did not produce well in the coming year. A newspaper account of 1851 documents Devonshire men firing guns (charged only with powder) at the trees. It is supposed that the custom was a relic of the sacrifice to Pomona [the Roman Goddess of Fruits]. Stand fast, root! bear well, top! According to a friend of this site, Ellen, wassailing of trees is still practiced in the Gloucestershire region of England. This practice echoes one practiced by Romanians. As the housewife kneaded special holiday dough in the kitchen, her husband would pass through the house on his way to the orchard, in a vile temper. She followed anxiously behind as he passed from tree to tree, threatening to cut down each barren one. She would urge him to especially spare this one or that, saying: "Oh no, I'm sure this tree will be as heavy with fruit next year as my hands are with dough this day." It was only later that these traditions became associated with "luck visits" made around the neighborhood, together with general merry-making (and, as Rev. Bradley pointed out, "fortified by copious quantities of alcohol"). Soon, these traditions would merge with the waits who traveled the streets of the cities (and who were paid to sing and play during the holidays). And voila! we have a tradition: wassailing. That being the case, the editors of the Oxford Book of Carols (OBC) suggest that Shakespeare (1564-1616) may have heard that fragment sung outside of his house at Christmas. Later, the meaning of wassail would become more narrow. By the way, the editors of the OBC suggest that verses two, six and seven of The Wassail Song "are not suitable when the carol is sung in church, but they give a vivid picture of the Waits of old times." "The oldest carol known (cf. Appendix I. p. 132 - Seignors Ore Entendez À Nus; translation from Sandys: Lordings, From A Distant Home), although Anglo-Norman, embodies the Saxon phrases used in pledging. The former of these has survived in the refrain of the initial carol of this group (Wassail, Wassail, Out of the Milk Pail), which is otherwise highly religious. In the seventeenth century the wassail was a definite institution — the carrying about of a bowl of spiced ale from house to house to drink healths in expectation of a contribution. Nowadays the utterance of a "Merry Christmas' is often judged sufficient for the tip. Some of the poems here included are mere drinking-songs, but they were probably sung as carols at Christmas." The word 'wassail' comes from the Old English "Waes hael" — that is, "Good Health!" The correct response was "Drinc hael." In Best-Loved Christmas Carols, Clancy and Studwell notes that the custom of wassailing may go back to the fifth century, although the first mention in print was in 1140; Vortigern, mentioned below, dates to the early fifth century. Sandys believes that the custom could date to the third century. The wassail bowl, of which the skull of an enemy would thus appear to have formed their beau idéal, is said to have been introduced by them. Rowena, the fair daughter of Hengist, presenting the British king, Vortigern, with a bowl of wine, and saluting him with “Lord King Wass-heil;” to which he answered, as he was directed, “Drine heile,” and saluted her then after his fashion, being much smitten with her charms. The purpose of father and daughter was obtained; the king married the fair cup-bearer, and the Saxons obtained what they required of him. This is said to have been the first wassail in this land; but, as it is evident that the form of salutation was previously known, the custom must have been much older among the Saxons; and, indeed, in one of the histories, a knight, who acts as a sort of interpreter between Rowena and the king, explains it to be an old custom among them. By some accounts, however, the Britons are said themselves to have had their wassail bowl, or lamb’s wool — La Mas Ubhal, or day of apple fruit — as far back as the third century, made of ale, sugar (whatever their sugar was), toast and roasted crabbs, hissing in the bowl; to which, in later times, nutmeg was added. The followers of Odin and Thor drank largely in honor of their pagan deities; and, when converted, still continued their potations, but in honor of the Virgin Mary, the Apostles, and Saints; and the early missionaries were obliged to submit to this substitution, being unable to abolish the practice, which afterwards degenerated into drinking healths of other people, to the great detriment of our own. Strange! that even from the earliest ages, the cup-bearer should be one of the principal officers in the royal presence, and that some of the high families take their name from a similar office. We still retain, and must for ever prize. In Caxton’s Chronicle [circa 1480] the account of the death of King John represents the cup to have been filled with good ale; and the monk bearing it, knelt down, saying, “Syr, wassayll for euer the dayes so all lyf dronke ye of so good a cuppe.” See: Wassail, Wassail, Out of the Milk Pail. As we will see, there were many traditions associated with the practice of wassailing, reflecting the differing traditions of individual communities and regions. formerly carried about by young women on New-year's eve, who went from door to door in their several parishes singing a few couplets of homely verses composed for the purposes, and presented the liquor to the inhabitants of the house where they called, expecting a small gratuity in return. As the song states, wassailers wouldn't object to a bit of beer or cheese either. William Sandys took note of an essay written by a Mr. Hunter who notices a payment of a hundred shillings made, in the time of Edward the Second (1284-1327), to Isabelle del Holde and Alisoun Conand, damsels of the queen, for crying Noël and Wessel. William Hone, in his The Year Book of Daily Recreation and Information (1832) took note of the expense book of one Sir John Francklyn in 1625 which contained the notation: "Paid for the cup 1s 6d." Hone explained that this was payment for a drink from the wassail-cup. William L. Simon, in The Reader's Digest Merry Christmas Songbook (1981) notes that the wassail bowl itself was a hearty combination of apples, spices, sugar, and hot ale or beer. The contents were referred to as "lamb's wool." Mr. Hone, in his Every Day Book series, has several discussions concerning the origin and contents: Lamb's-wool. In short: The first day of November was dedicated to the angel presiding over fruits, seeds, &c. and was named La Mas Ubhal, that is, the day of the apple fruit, and being pronounced lamasool. The English have corrupted the name to lamb's-wool. Keyte and Parrott state that the bowl was often garlanded and ribboned. Although wassailing was primarily an Epiphany Eve custom in most places (and which in some places was called Wassail eve, according to Sandys), as we have seen, it was also observed at other times during the season, including St. Thomas Day (December 21), Christmas Eve, and New Year's Eve. See these notes by A. H. Bullen following Here We Come A-Whistling. * "The custom of drinking out of the same cup gave place to each having his cup. When the steward came to the doore with the Wassel, he was to cry three times, Wassel, Wassel, Wassel, and then the chappell (chaplein) was to answer with a song. "- ARCHAEOLOGIA. * From Poor Robin's Almanac. Editor's Note: I have observed the same effect in modern times, even when the wassail is of a less complex recipe. William Sandys confirmed that many of the great manors had, and probably still have (at that writing in 1853), wassail bowls of "massive silver." He also noted that in Bed Jonson's Christmas, His Masque, the character of "Wassail" was described as "a neat sempster and songster; her page bearing a brown bowl, dressed with ribbons and rosemary, before her." William Chappell also has a good account of this tradition in the Notes on Tunes in his A Collection of National Airs. (London: Chappell, 1838), Notes on Tunes, No. 212, The Wassailing Bowl, pp. 160-162: The Wassailing Bowl. The eight-stanzas of Wassail, Wassail, All Over The Town - Version 7 are found on p. 161. Additional Epiphany Eve celebrations are described in Hone's accounts of January 5 – Eve of Epiphany. At times, however, the practice of wassailing has degenerated into nothing short of armed home invasions. The banning of Christmas altogether in both England and the American colonies by the Puritans and Pilgrims were, in small part, a reaction to these and other excesses (certainly larger theological issues were at work which led to the English Civil War). 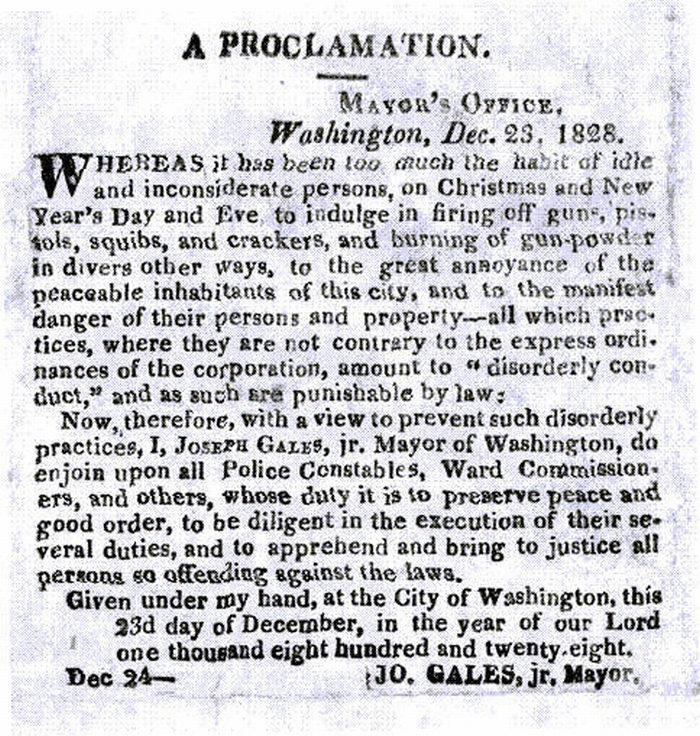 In the early 1800s in New York, prominent citizens were very concerned about such practices (which also featured such actions as gunfire, drunkenness, sexual licentiousness, excessive gambling, and riots; see the proclamation of the mayor of Washington, December 23, 1828, left). It was their desire to take Christmas off the streets and into the homes. The evolution of Christmas practices in those years was a direct result. One change was from "wassailing" (and a wassail bowl containing alcoholic beverages) to "caroling" (which was more likely rewarded with hot chocolate, cookies, and the like). The custom of caroling was one that was very wide-spread, especially in the country (as opposed to urban areas, although the waits would continue the practice until the organization of official metropolitan police departments). Rev. Bradley reported that a book on Popular Antiquities [presumably Brand's], published in 1795, noted that in Newcastle upon Tyne and other places in the North of England boys and girls went round on the nights leading up to Christmas, including Christmas Eve, "knocking at the doors and singing their Christmas Carols." I had scarcely got into bed when a strain of music seemed to break forth in the air just below the window. I listened, and found it proceeded from a band, which I concluded to be the waits from some neighbouring village. They went round the house playing under the windows. I rose softly, slipt on my clothes, opened the door suddenly, and beheld one of the most beautiful little fairy groups that a painter could imagine. It consisted of a boy and two girls, the eldest not more than six, and lovely as seraphs. They were going the rounds of the house, and singing at every chamber door; but my sudden appearance frightened them into mute bashfulness. They remained for a moment playing on their lips with their fingers, and now and then stealing a shy glance from under their eyebrows, until, as if by one impulse, they scampered away, and as they turned an angle of the gallery, I heard them laughing in triumph at their escape. But there was a concern that caroling was passing away. The older people remembered it, but the younger people did not know it, or did not know it very well. William Hone in 1822 spoke of caroling as a form which was dying out, noting only 89 carols currently in print. He wrote: "Carols begin to be spoken of as not belonging to this century and yet no one, that I am aware of, has attempted a collection of these fugitives. As the carols now printed will at no distant period become obsolete, an alphabetical list of those in my possession is subjoined." Here is his list: Christmas Carols now annually Printed. It is unfortunate that he did not provide the lyrics of those carols; when I first encountered this list, I was able to find only about a third of the carols, although by Christmas 2016 more than 75% had been found. But as Hone's book went to press, there was a sign. Mr. Gilbert Davies, MP, had published the words and music to eight carols. Hone noted: "This is a laudable and successful effort to rescue from oblivion some carol melodies which in a few years will be no more heard." The next year, Mr. Davies would publish eleven more. It was a start. After the Restoration, the people gladly returned to their amusements without restraint, and from the reaction, in many instances perhaps, went into the opposite extreme and indulged in too much conviviality. Carol singing was renewed with increased zeal. It so continued down to the present century, when it apparently began to abate; but it will be unnecessary to give any references to prove the continuance of such a custom, when, to a certain extent, it exists at present, though this and other observances are much shorn of their honours.’ Many of us will recollect when at Christmas time every street of any note had its carol singers, with their bundle of various carols, whereas now scarcely one vagrant minstrel can be found throughout the town, brass bands having blown them out; but there is still some demand for the carols, and specimens of broadside carols may be procured from the printers of this class of literature, in St. Andrew’s Street, Monmouth Court, Long Lane, and elsewhere. In Birmingham also, and other large manufacturing towns, and other neighbourhoods where the practice of carol singing is retained, popular editions of the style called chap-books, as well as broadsides may be found; several of them of considerable antiquity, handed down for many generations, and frequently illustrated by woodcuts of the most grotesque nature in point of execution and design. Many of us will also recollect when carols were sung in the country, not only in the farm-houses, in mansions, and baronial halls, but likewise in churches — as Heath says, was the custom, in Scilly, in the middle of last century — and this with much propriety and right feeling. It was a hearty note and strong." Each succeeding year shows a falling-off in the number of houses where the practice is now admitted; and in many parts the carols are scarcely heard at all, people getting too refined, or — too good (? ); the extreme west and north, and some of the manufacturing districts, being the most likely places to hear them, as they were, in former times, among the yeomanry of our land. But Mr. Sandys offered more than despair; in 1833 he published the words to 80 carols, plus the music to 18. He performed a similar feat in 1852 (42 carols, 12 musical settings), and the editors of the New Oxford Book of Carols (see Appendix 4) believe that he and William Henry Husk combined in 1861 to publish "Christmas Carols: Ancient and Modern" under the pseudonym of "Joshua Sylvestre." Husk published his own volume in 1868; not surprisingly, some portions of it resembled the work of Sandys and "Sylvestre." He would not be alone in that distinction. Many would acknowledge that debt. Soon, many collectors, recognizing the magnitude of the potential loss, were combing the English countryside. Many significant collections would be published in the coming decades, and continue to be published as historians, amateur and professional, would scour old books, newspapers, journals, and hymnals — and share their bounty. The creation of a world wide web has only spurred this sharing. I do not mean to slight the extensive work done by collectors in other countries. It is my ignorance of those languages only which hampers my ability to acknowledge their work. As mentioned in my Frequently Asked Questions (FAQ) page, I would be happy to link to others who have created similar collections in their languages. There is still caroling, although its nature seems to have changed, at least in the United States. The village town center has evolved into the metropolitan shopping mall ... and there, throughout the holiday season, the carolers can be found. Carolers from grade schools, high schools, colleges, and community groups can be heard throughout the day and evening. Concerts in schools and community centers are numerous. While I haven't heard a group of carolers come through my neighborhood in 40 years (and, truthfully, they were wassailers), I don't have to go more than 50 meters (to a neighborhood church) to hear a beautiful concert of holiday music. If I'm willing to go as far as 4 kilometers, I can choose from a half-dozen churches, a library, a community center, and a senior center. It's an embarrassment of riches for anyone who loves the music of the season. Yorkshire Wassail (We've been a-while a wandering) . Studwell notes in The Christmas Carol Reader that this carol is probably of the same century and region as "Wassail Song." ... and many others. This is an especially rich source of information concerning wassailing — complete with numerous songs, stories, recipes, and other treats. Recommended! New!! Just Released!!! The Book of Wassail -- Now available!!!! A five volume study of wassail-music, literature, folklore, recipes and more. Hundreds of songs. Nothing like it has ever been published. Get it at The Wassail Page!!!! Wassailing was also practised in the counties of Surrey and Sussex (my home county) where it was generally known as 'howling'. The northern part of Sussex and adjoining areas of Surrey once constituted a significant cider producing region. Traditional cider production is unfortunately now virtually extinct in these areas (with some notable exceptions, e.g., JB Cider in Maplehurst, West Sussex). Wassailing takes place at Maplehurst and at Waldron in East Sussex and at other places in the area though these are likely to be revivals rather than survivals. Hole (1976) [A Dictionary of British Folk Customs p. 318] also mentions that very similar customs took place on Twelfth Night or the First Sunday in Lent in Normandy's cider producing regions to bless the apple trees. In 2007 I had some fun with the song "Here We Come A-Wassailing" while working on my Christmas CD. I noticed a similarity between the notes for "so fair to be seen" and "You must remember this" from "As Time Goes By," and thought it would be fun to have the melody of the wassail song take a brief detour through Casablanca for those six notes and then return to its normal notes. The project expanded from there with references to Jay Leno, ER, Lost, and several others (all Burbank-based) and eventually became a medley, "Ringtone Wassail/Burbank Wassail." In October of this year I created a music video with just the Burbank Wassail on the track, which you can view on YouTube. Hot babes in Santa suits (no, full Santa suits)! Snow! Adorable kids! Ballerinas! Christmas lights! Fireworks! The music video mashes clips from YouTube videos and other images by Burbank residents and visitors. See if you can find yourself and your friends in the video! The original song created by John is on one of his Christmas albums, "A Christmas Motley," which is available from iTunes, Amazon, CD Baby and elsewhere. "A Christmas Motley" and "Holly and Hearth" feature a selection of Christmas carols ranging from the 11th through the 19th centuries, plus three of John's own compositions. The albums explore historical and contemporary styles, and the arrangements create moods from playful to meditative. See also Apple Howling and Firing At The Apple Trees (Hazlett's 1905 edition of Brands Popular Antiquities). And see from William Hone, The Every Day Book: January 6 - Epiphany. Finally, there is also Ceremonies For Christmas - A. H. Bullen. Ian Bradley, “Sing Choirs Of Angels,” History Today, December 1998. Ian Bradley, The Penguin Book of Carols . London: Penguin, 1999. Brand's Popular Antiquities Of Great Britain, W. Carew Hazlitt, Faith and Folklore: A Dictionary of National Beliefs, Superstitions and Popular Customs, Past and Current, With Their Classical and Foreign Analogues, Described and Illustrated. Forming A New Edition of "The Popular Antiquities of Great Britain" By Brand and Ellis, Largely Extended, Corrected, Brought Down To The Present Time, and Now First Alphabetically Arranged. In Two Volumes London: Reeves and Turner, 1905. A. H. Bullen, A Christmas Garland. London: John C. Nimmo, 1885. Ronald Clancy and William Studwell, Best-Loved Christmas Carols. Christmas Classics, Ltd., 2000. William Chappell, ed., A Collection of National Airs. (London: Chappell, 1838), Notes on Tunes, No. 212, The Wassailing Bowl, pp. 160-162. Ancient Mysteries Described. London, 1823. Ward Lock Reprints, 1970. The Every Day Book. Two Vols. London: William Tegg, 1825, 1827. The Year Book, London: Thomas Tegg, 1832. William Henry Husk, Songs of the Nativity. London: John Camden Hotten, 1868. Washington Irving, The Keeping Of Christmas At Bracebridge Hall. London: J. M. Dent & Co. 1906, pp. 57-8. This was an excerpt from the longer Bracebridge Hall (1822); Bracebridge Hall was modeled after Aston Hall, leased from Adam Bracebridge by James Watt. Hugh Keyte and Parrott, eds., The New Oxford Book of Carols. Oxford: Oxford University Press, 1992. Clement A. Miles, Christmas in Ritual and Tradition, Christian and Pagan. London: T. Fisher Unwin, 2nd Ed. 1913. Edith Rickert, Ancient English Christmas Carols: 1400-1700. London: Chatto & Windus, 1914. Christmas Carols Ancient and Modern. London: Richard Beckley, 1833. A seminal collection. Christmas-tide. London: John Russell Smith, 1852. More designed for the general reading public; fewer carols, but a more extensive history. This has nothing to do with wassail, but since we're on the topic of old English beverages, I was wondering what Dickens meant when he had Scrooge propose to Bob Cratchit that they share "a Christmas bowl of smoking bishop!" American National Public Radio reporter Neda Ulaby reviewed the book Drinking With Dickens by Mr. Cedric Dickens, the great-grandson of Charles Dickens. In the book, Mr. Dickens reports that people back in the 1800s enjoyed a whole range of "clerical drinks." "Pope is burgundy, Cardinal is champagne or rye, Archbishop is claret, Bishop is port, and so on," Dickens wrote. • Take six Seville oranges and bake them in a moderate oven until pale brown. If you cannot procure any bitter Seville oranges, use four regular oranges and one large grapefruit. • Prick each of the oranges with five whole cloves, put them into a warmed ceramic or glass vessel with one-quarter pound of sugar and a bottle of red wine, cover the vessel, and leave it in a warm place for 24 hours. • Take the oranges out of the mixture, cut in half and squeeze the juice, then pour the juice back into the wine. • Pour the mixture into a saucepan through a sieve, add a bottle of port, heat (without boiling), and serve in warmed glasses. • Drink the mixture, and keep Christmas well!